In THE SUN SHINES BRIGHT, Asimov’s legendary versitility is once again on display. From the satellites of Mars and Jupiter, he takes us to a sunrise on Venus and then to the incredibly dense star, Sirius B, where a 25¢ piece would weigh 2.1 tons. From there he travels through the human psyche to explore the frailities and foibles of our men of science. 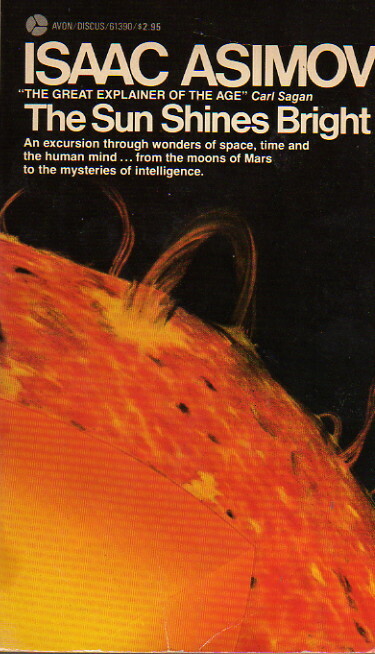 But wherever Asimov takes us, whether it’s to the teeming streets of Bombay or the dark side of Mercury, he leads the way with a lively and supple mind that shines exceptionally bright. By this point in the history of Asimov’s F&SF science column, fewer and fewer of the individual essays stand out in my mind. In part, of course, it’s because I was rather older when I read them for the first time, and in part it’s because I’ve reread them less. In any event, while this is still a collection which I would recommend with warmth, the individual essays in it are not always among my very favorites. Some are memorable: “Alas, All Human” on IQ testing and the inability of scientists themselves to overcome their prejudices; “Clone, Clone of My Own” on cloning (of course); “More Crowded!” on overpopulation; some of the astronomy essays. I’m really praising with faint damns here—I really have nothing against this collection, but it pales in significant to some of its older siblings whose memories are much warmer such as Science, Numbers, and I. The problem here is not that this is a poor book, but that it tends to hang around with much better ones and looks comparatively bad as a result.